Daily Illuminator: SWAT's New At e23? January 20, 2014: SWAT's New At e23? Sometimes when things go wrong, you call the police. And if things get really bad, you send in the SWAT team. 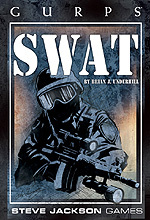 GURPS Classic: SWAT looks at all aspects of tactical police operations: a history of tactical teams, a look at SWAT around the world, an overview of how SWAT teams do what they do, weapons and gear, and more. Whether you're looking for tactics, tools, or tips for running SWAT-based games, this supplement has secured the perimeter to get you what you need. Pick it up now, from the electronic armory of e23!